I hope everyone has a safe and warm (for those of us in very cold Salt Lake) New Year. 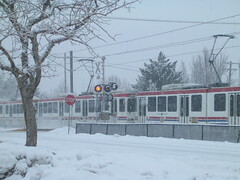 I hope you enjoyed 2007 with Transit in Utah and we have more coming in 2008. 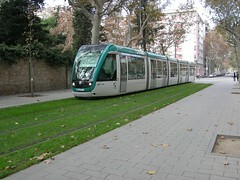 The photo is another one of the Barcelona Streetcar. Notice how well the streetcar blends in and the grassy right of way. This is design at its best. Don' t forget that UTA fares will be going up on New Years Day. Oh wait fares will be going up for everyone but ski bus riders on Wednesday since there is not service on Tuesday except the ski buses. Base fare will go from $1.60 to $1.75. It seems that this video has been popping up everywhere lately so I figured I would show you. This is a video showing what Walt Disney that the highways of the future would be like in 1958. You look at this video and you realize how far we have not come over the years. Basically automobiles and automobile travel has not changed in 50 years. One of the favorite arguments of the anti-transit types is that rail is outdated. Of course this in itself is 1950's thinking. The truth is we have seen little changes in automobiles in the last 100 years. They have gotten bigger motors, more safety features but are essentially the same was when Henry Ford started rolling the Model T off the assembly line. I walked out yesterday to get my mail when either the 307 or 320 flew by me on Van Winkle. It was one of the brand spanking new Gillig Advantage BRT look buses and I was disgusted to see that the bus had a full wrap on it. Now anyone who has read my blog for long knows that I despise them because they are so anti-customer. Just try to look out of a wrapped window (go down to the June 25th entry). Not only that, but they have wrapped a brand new bus. 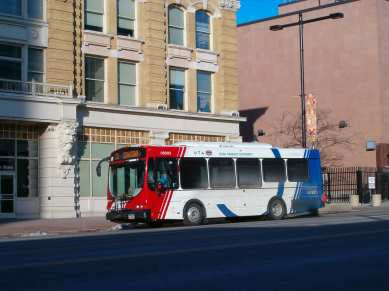 Transit systems such as the Spokane Transit Authority will wrap buses that need to be repainting because of the damage that can be done to the paint but I guess UTA doesn't care about our expensive capital resources enough. 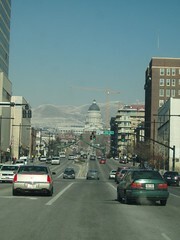 How often do you try to cross some of our streets here in the Salt Lake region? If the answer is even infrequently you know the dangers that lurk in our crosswalks. First of all you face the right turn drivers that do not pay attention if there is any pedestrians in the street, and then you face making it all the way across our wide streets without getting hit by left turning drivers or right turning drivers. To make things worse, while the signal cycles are even tight for someone like me who can walk fast, the cycles are deadly for a senior citizen or anyone else who can't walk fast. As our population ages this will become an even greater issue. Sadly it seems that most of the street planners feel that if they slap some haphazard sidewalks along side the street and place your token crosswalks they are set. The sad truth is that most of the people designing our roads have no idea how to design things for pedestrians. Our streets are designed for cars and that is it. Now take a look at the picture of State Street. How can it be made safer for pedestrians to cross? First of all because of the extreme width of our roads there needs to be pedestrian medians installed in the center of the road. This will allow slower people to make it half way without taking their life into their own hands by having to make it all the way. In the median you would have additional pedestrian lights and the push to walk buttons were appropriate. More pedestrian friendly cities have these so called "pedestrian medians" or "escape zones" even on narrow streets with one or two lanes in each direction. It is an extra measure of safety to protect pedestrians. Another element of safety will be flashing lights at the corner warning drivers to check for pedestrians. Some would argue that this would detract drivers even more, but with drivers being too busy talking on their cell phones, listening to their i-pods, doing their makeup and everything else they do in cars these days, pedestrians need every element of safety protection possible. We need to rethink the way we design our streets. Clarence from Streetfilms let me know that they have posted another film with Dr. Should that discuss parking. Article on how UTA is getting ready for major construction on rail lines. Of course they always have to "balance" the article with someone who is still living in the dark ages and in this case it is Taylorsville mayor Russ Wall. He says he wants a more balanced approach with more roads. Isn't it interesting that they could be calling for a more balanced approach when for the last 60 the highway men have been in charge? Maybe Mr. Wall needs to look toward the way his own city is developing and realize that he and his cohorts in city government have created the problems they are facing. Just look at the poorly designed developments from 5400 South to Interstate 15 on Redwood Roads. Once again you have developments that increase traffic congestion not help with it. There is nothing in this area to encourage walking and not taking a car from one store to another. I also wonder where Mr. Wall thinks that new roads will be built. Should they take tax producing properties and make more roads? Article talking about the sprawl that is taking place in St. George and how it is affecting our ancient history. While some headway is being made in preserving important pieces of history such as petroglyph's and pictographs development continues on. So long as developers do not have to pay the true cost of their developments, this will continue. 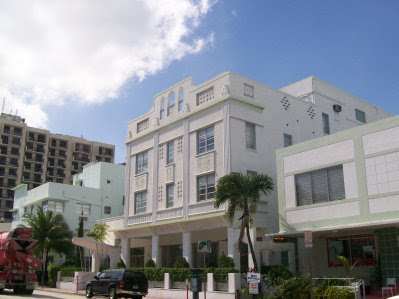 Some developers are incorporating the history into their developments which is a start. As anyone who regularly reads my blog, you will know that I am opposed to the Bus Riders Union. In Los Angeles 10 years after the BRU won a court order to improve bus service, service is at an all time low and the only people who won were the lawyers who got rich and Eric Mann who was the head of the BRU with a salary close to John Inglish's. The BRU caused the MTA in Los Angeles to spend money it did not have, run routes that did not make sense, and keep fares artificially low. While I was not happy with the changes that UTA made in some areas, we also have to recognize that the funding will only go so far. The only way the BRU achieved what it did in Los Angeles was by race baiting and dealing with a board that more interested in scoring points than what was best for transportation. -Sounds like a problem with the owner of their nursing facility not UTA's. If it is a problem talk to their landlord. -Once again how is this UTA's problem. They would not route a bus down a side street were these people are so what is the complaint to UTA here? While I agree that narrow sidewalk's are a problem, that problem rests with poor urban planning, not UTA. -This sounds like a problem for the city not UTA. How is UTA to blame for this? -Once again this is a problem with the auto repair shop, not UTA. Maybe if they would nicely go and talk to the owner he would take care of the problem. Instead they will probably go in and threaten a lawsuit or something and just alienate the small business owner not win the owner over. 6. Complains that bus stop has grassy area in front of it. Sprinklers turned on in summer. -Ok, here is a problem that UTA can deal with but it is not UTA's fault that a property owner turns on the sprinklers. What if they went in and talked nicely to the landlord and told them their problem? 7. Drivers come flying out of the Maverick parking lot that is on the corner. -Can we once again say a city planning issue not UTA's fault. There is not much UTA can do abut having driveways near a bus stop. Once you get to the end of the video you do see that the bus does come behind their building were an old bus stop was. OK, I see it is reasonable that a bus stop be reestablished there if it is safe, but they also want nite ride like the old 107 so they will not be shut in at night. Well that is a little more trickier isn't it. How much is it going to cost to restore the nite ride service? More importantly how much is it going to cost? Restoring the bus stop they complain about should not be a big problem after all, but restoring the nite ride would be extremely expensive. This is were the danger is. While I think UTA can do a better job with it routes instead of using the transit mentality of "no duplication" and create routes using a marketing matrix system, you cannot run routes into the night if they are getting only one, two or no riders. As much as I depended on the old 124 when I lived in Sandy and worked to 10:00pm at night, the 124 was only carrying one or two people and many times no one. If I was still living in this apartment I would not have a night ride and would face an hour walk home. However, bus service cannot be justified when so few are using it. Otherwise we would have the massive bus cuts that Los Angeles area is now facing. Now if we could get more people on the bus during the day, which would require a more marketable service, our bus service would be bring in enough revenue to justify the nite service. Until that time UTA cannot run a bunch of nite ride service with few to no riders. I have been asked to mention this and since Toastmasters has helped me in my public speaking I had no problem publicizing this event at the downtown library. This event is open to all and I urge everyone to come and overcome their fears of public speaking. Organize your presentation, and much more. January 15, 2008; 7 to 8:30 p.m. Presented by Metro Toastmasters. Visit us at www.metrotm.org. This is a ten minute video from the California High Speed Rail project. I first saw this video in March at a meeting I attended in Los Angeles. Is California ready for high speed rail? I personally am an advocate for upgrading the existing passenger train network and not spending the money on high speed. Our biggest problem with current rail passenger service is Amtrak itself. Amtrak has the same problems as many transit systems which fits since it's previous two CEO's were former transit managers. Europe and Japan only created high speed rail lines when their existing lines went beyond capacity. While me may currently have issues with freight capacity, we do not have an issue with passenger trains being at capacity. However, if the voters of California vote for it then go for it. I found the link to the video from the Capricious Commuter which is a Bay Area based blog. The anti-transit types will be jumping on this article. UTA overestimated TRAX ridership because it was doing manual counting instead of computer generated counting. What should be noted here is that ridership is still ahead of projections and doing well. Even in the off peak periods trains have many people on them. While this is another one of those public relations nightmares that UTA is so good at, it is not the end of the world. The only problem is you have people like Valentine who want to steal transit money for other projects and this just gives people like him ammunition. I cannot believe it myself but I have reached entry number 500 at Transit in Utah. I started this blog way back in August of 2005 as a way to talk about the issues that pertain to the Utah Transit Authority. Over the past couple of years Transit in Utah has evolved. After reading other transit related blogs over the last couple of years I have been able to take ideas from those and adapt them to Transit in Utah. Transit Miami has been a big influence on what Transit in Utah is becoming. I have always had an interest in Urban Planning and know that good planning is critically important to the success of a city and a transit system. I am trying to put some of that information into the blog. Thank you to all my loyal readers and those who just stop by now and again. I hope you have been enjoying the blog and will continue to do so. One last thing, I know that some pro-highway people try to portray transit supporters as anti-car. 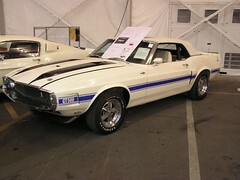 Well just to show that is not true the picture is one of my dream cars and of course keeping with the theme it is a 1970 Shelby GT 500. I would not argue if this was in my carport on Christmas Day but transit would still be my choice. Here is a promotion video off of youtube celebrating DART's 10 anniversary since opening their first rail line. While the video is a year and a half old, it does a good job of showing what is happening in the Dallas area when it comes to light rail. It is interesting that they mention the recently opened American Airline Arena station as the beginning of a major expansion much as the Intermodal Extension here in Salt Lake is the start of TRAX's major expansion projects. This article mentions the new buses now being utilized on the ski bus service. In years passed I have railed against the ski bus service as it is now set due to its high cost and great waste of capital resources. This article allows a perfect examination of what a waste of capital resources it is to run the service. My big problem with the ski bus service is the buses run only 4 months a year then sit for the other 8 except for an occasional trip. This greatly wastes precious capital resources on a very special limited service. While Justin Jones may say UTA is not a social service agency, the ski bus service proves him wrong. Now lets take the cost of one of these new buses at 3.6 million. That means that the capital cost per revenue day on a ski bus is $2600 while the revenue cost of the same bus being used in regular service is only $1050. Instead of wasting valuable capital resources on the ski bus service they should instead use those resources on regular routes. While some people may not like what they hear, if we are to continue running the ski bus service like it has for the last 31 years then UTA should be using buses on these routes that its about to retire. Since UTA usually has buses sitting around waiting to head to auction, it should use these buses for the ski bus service every year and leave the newer buses to other roles. That way a vital capital resource is not being wasted. As I have mentioned before in the past, either UTA needs to contract this service out to a company that would provide the buses or it needs to find a use of the buses the rest of the year. While Zions Park already has it's own buses, that is a perfect example of what should be done with the ski buses instead of sitting in the garage. It is travesty to be wasting a 3.6 million dollar piece of equipment when it sits more than 66% of the time. The is the problem with not charging developers for the cost they create. How much traffic is being created by developers both of commercial and residential development. Until we actually have to pay the full price of development it will go unabated. It seems that the sky bridge has become a contentious issue about the City Creek project. Many people seemed to think the sky bridge is wonderful just because Rocky is against it. I could care less if Rocky loves the thing or hates, I personally think the sky bridge is a very bad idea. Downtown Reno is the perfect example of what a sky bridge can do. 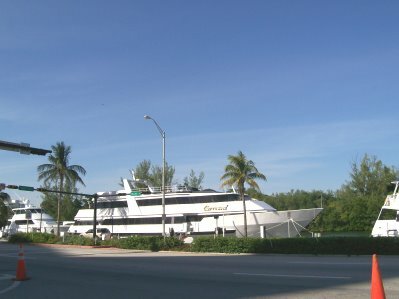 The three main casinos in the are the Circus Circus, Silver Legacy and the El Dorado. 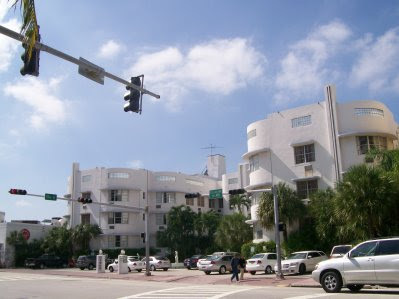 All three of the hotels under common ownership are connected to each other via sky walks which you can see to the left of the photo. The sky bridges are designed for one thing: to keep people in the casinos. On the street level you see a few people but for the most part the pedestrian action is non-existent. In the picture you are looking north toward the Circus Circus. 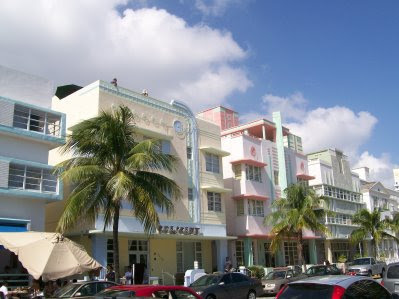 Along the Silver Legacy there is a facade of old looking buildings that are all fake. There is not actually entrances or anything. Even during the day there is very little pedestrian action on the streets. You can't blame the casinos for wanting to keep all the business to themselves but their actions have largely killed the the rest of the downtown area. The City Creek sky bridge is also designed to keep people in the development which will choke off pedestrian traffic along Main Street and the surrounding areas. Another example of what sky bridges do is Downtown Spokane. 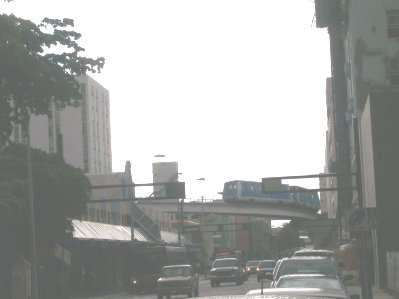 Spokane built an extensive network of sky bridges during and after Expo 74. What essentially happened was the people moved up. They stopped walking around along the surface streets and only shopped from the sky walks. The street level died as a result and you started getting the impression that Downtown Spokane was dead. Eventually many of the stores started to close and be turned into offices and the downtown area became a 9 to 5 area. While not all of downtown's problems could be blamed on the sky walks, it was clear that they were a contributing factor to the decline of the area. It has taken more than a decade for things to start changing in Spokane. There was other issues like a big mall issue but bring back the street life over the last few years has help the downtown area. While there has been claims that the sky walk at City Creek will have access to the street level, the sky bridge is designed to keep people in the City Creek complex. People need to not let emotion rule the decision over the sky bridge. Instead let good urban planning that is designed to enhance the entire downtown area, not two single blocks make the decision. No surprise that the Draper NIMBY small minority was out in force to stop the big evil TRAX line from using the route it should be using. The biggest laugh was Ron Page showing that he is one of those people who still has not faced reality and using the road warrior mantra "no one will ride it". We all know that stupid line was wrong and for anyone to be using it at this point is just plain out there. I do notice that the are not saying it should go down State Street anymore just farther west. 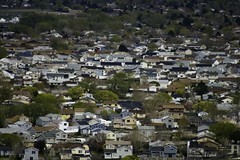 In other words anywhere but their precious neighborhood showing that they are NIMBY's in the truest sense of the word. A majority of Draper supports TRAX and it should be using the private right of way that is designed for rail. Interesting that only 12 people showed up to oppose the viaduct. If this was the end of the world for the west side as it has be portrayed to be, you would think that turn out would have been a little higher than this. But then again the Trib articles says "dozens" showed up so which was it? The decision should not be made on emotions, red herrings like "crime will increase because of the viaduct", or the wants of anti-transit Boyer, it should be what is going to be best for the long term balanced transportation needs of the Salt Lake region. Looks like UTA is trying to look like the good guy after several embarrassing public relations blunders over the last few months. How many people knew that UTA was going to cut routes if the tax increase didn't go through because of the food tax cut? I never heard it mentioned, in fact if you look at all the materials from the election, it was a vote for more highway money and that was it. Bike Sharing: Coming to a City Near You in 2008 (Unless You're in Miami) or Salt Lake City. It looks like the Airport TRAX line will indeed go down 400 West instead of 600 West so the westside can celebrate it's victory over a good transportation idea. While I do like seeing Boyer lose on this one, having the Airport line made a direct connection to the Intermodal depot is vital to building a good balanced transportation system. 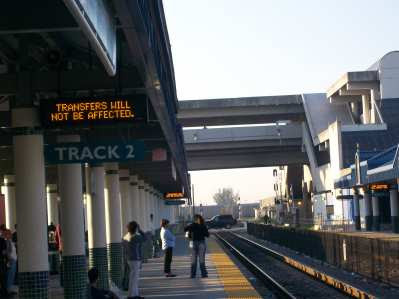 While the line will still connect with commuter rail at North Temple, the line will not connect with intercity bus service or Amtrak. While Amtrak is currently a joke (although I do ride it when it works for me) I hold for the possibility in time we will have a well designed intercity rail service in this country. Three cities that have put people movers to work are Detroit, Miami and Jacksonville. In all cases you can argue how successful the systems has been. 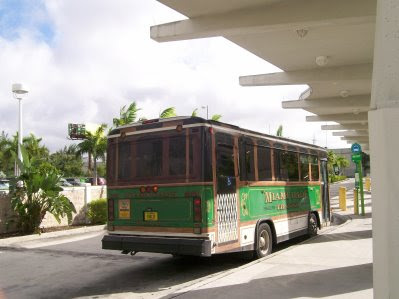 In Miami there used to be a .25 cent charge to ride the system but that was eliminated in 2002. Here is what my feelings are toward the Miami system after riding it for several days in November. 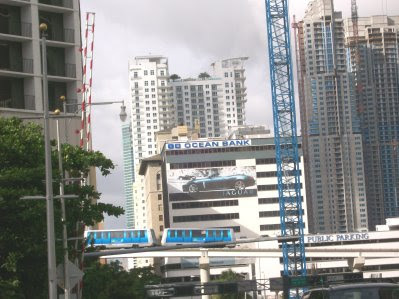 Here is one of the MetroMover cars just east of the Omni Station heading for the end of the line at School Board Station taken when I was in Miami. I will have to say that traveling on the people mover is not that bad, although it probably is a little rougher than TRAX or a streetcar would be at the speeds it travels at. The cars do not hold that many people seated and most end up standing. Since there is no operator passengers do have a good view out the front of the vehicles. Here you see one of the cars approaching the Omni Station which is located next to a dead mall call the Omni Center. The mall is being turned into a office building. One of the problems you have with this type of system is how poorly in interacts with street level. In other words it does not induce pedestrian traffic. In addition you can see the huge infrastructure required for a station. Now this station is only set up for two car MetroMover trains and Metromover cars are much smaller than a light rail vehicles or monorail car. Can you imagine the size if it was designed to handle a monorail train that could hold as many people as a TRAX train? This is something that Monorailist just can't seemed to comprehend, and that is how much infrastructure is truly required to handle a monorail train. However even light rail needs to be elevated at times (in fact the West Valley line should be elevated not at street level) but should only be used as a last resort. 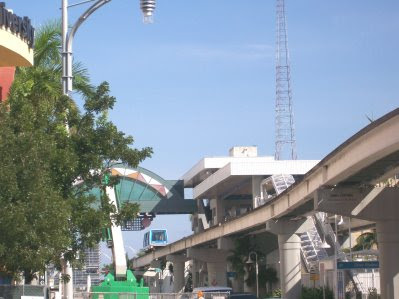 As can be seen in the pictures below the Metromover just does not interact with it's surroundings very well. Can you imagine that this concrete monstrosity of a station creates an interaction with the sidewalk below? In fact few people seem to get off this station despite the Miami Riverwalk below. Now the station has to be this tall because after leaving this station the MetroMover goes over the Miami River and has to be tall enough to clear without a drawbridge. What would interact better with the area? Well streetcars interact much better than the Metromover, the only downfall is that it would have to travel over the river on a drawbridge but then again most of the traffic is leisure travel and not frequent. 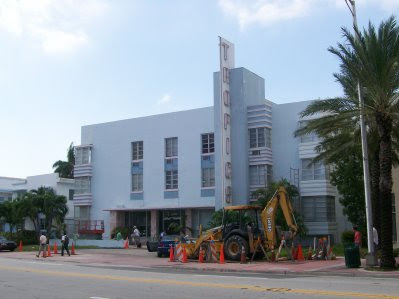 Miami is moving forward with a streetcar proposal. Some have suggested that since the streetcar will pass the Omni Station and within a half a block of three other of the Omni Loop Stops, that the Omni Loop be torn down and the track used elsewhere. While it does look cool to see these cars going overhead, they do not provide the interaction between themselves and the community below. 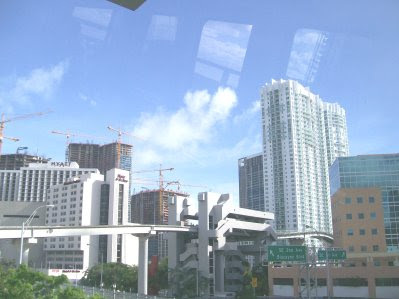 While Downtown Miami has several new skyscrapers being built, none of them, even one with a MetroMover station along side of it are being designed to interact with the MetroMover. 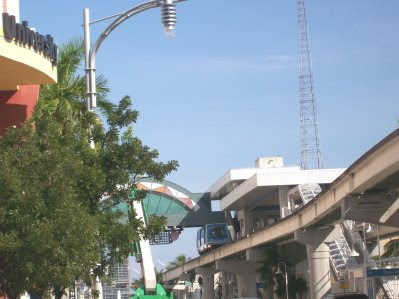 If they would be designed to interact with the Metromover, it would do wonders to increase the utility of the line, however, it would still not solve the problem that the Metromover does nothing for the street environment on the area. While a Metromover may have a place at places like Disneyland, it just doesn't do the job we need to do in our cities today. I have to thank Transit Miami for providing the information on this video. My presentation from Railvolution has been posted to the Railvolution Website. I focused on how to bring small businesses into community partnerships plus dealt with issues with why businesses are so concerned of major projects. Sadly some of the transit people were not really receptive to hearing some of what I had to say but I was trying to give them a small businesses persons perspective and what they should do. I also discussed some of what went wrong during the Main Street TRAX construction and what is happing now with Downtown Rising. 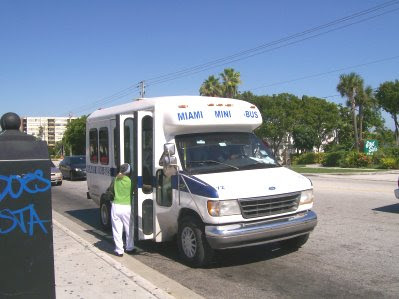 First of all fares, etc: Currently the Miami system has a lower fare since it is $1.50 while the UTA is $1.60. However, in at UTA you get a free transfer but in Miami you have to pay $.50 for a transfer and you can only use it once. 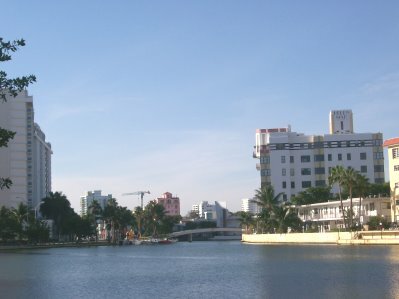 In addition UTA does offer a day pass (even if it is too hard to get), but there is no day pass in Miami. Miami does have their visitor's pass which is good for a week and is a good value which is something that UTA may want to look at. While Miami may have a lower fare, you have to pay $75.00 for a Miami Dade monthly pass compared to a pass price of $53.50 at the UTA. When it comes to fares UTA wins by decision. Information and Ease of Use: Miami Dade does win as it does have a counter at the Miami airport (ok, no one was present there but it had schedules) however, only one Miami Dade bus had timetables on it and none of the train stations had any although there was racks for them. 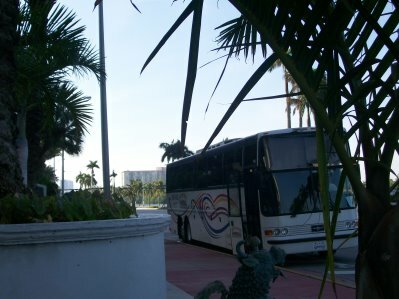 Miami did do bus changes a week and a half before I arrived but one thing that you can say about UTA is that when the changes take place there is timetables available on the buses and at other locations. When it comes to ease of use we have a draw. Neither system has timed transfers and transfers are not really considered on either system. Drivers: OK we have a huge win for UTA. Whatever you think about UTA, it does have one of the best group of drivers of any system I have ridden. Yeah there is the jerk every now and again but overall UTA has good drivers. Meanwhile I only encountered one somewhat helpful driver and all the rest were down right bad. 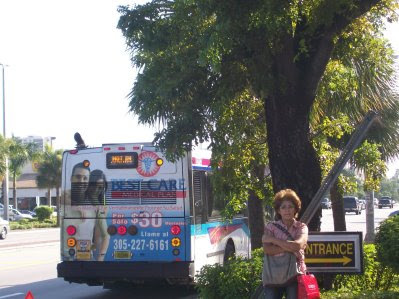 Miami-Dade should be ashamed at the way their drivers treat their customers. 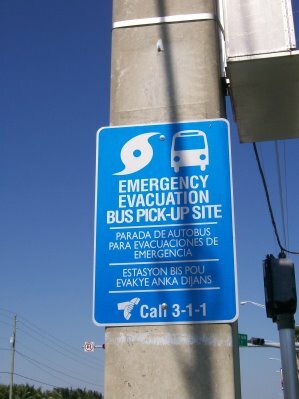 Bus Stop Signs: One thing that Miami-Dade does well is having a route map at every bus stop (at least every bus stop I was at). The map also shows the frequency of the route but does not have times. Meanwhile UTA has information at some stops which includes the times the buses should be at the stop but do not include route maps. So this one is a wash however I will note that when I was at the South Dade MetroRail station I had no idea when my next bus would arrive. Since there was no timetables available I had no idea when the next bus would come since all the sign said was the route ran every 40-minutes during the day, 20-minute rush hour. Apparently I just missed a bus because I had to wait 35-minutes. If I knew the wait would be that long I would have caught another bus route since I was looking for a restaurant. Buses/Rail: Once again we have a win for UTA. 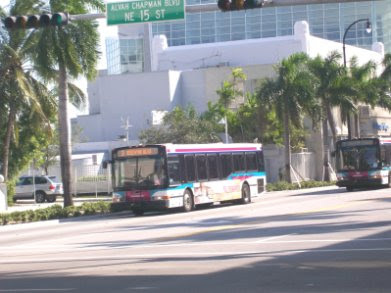 The Miami buses are done up to stop vandalism. The buses are done in dark colors on the inside, have hard anti-vadalism seats and are generally not a pleasure to be in. Meanwhile UTA does have better quality seats in their buses plus a better color scheme. Meanwhile it is a wash for the Miami MetroRail since they do have cushioned seats on their rail vehicles. One thing that lowers Miami-Dade is the amount of graffiti present around the system. They seem to not deal with it at all, just leave it up. So after years the system looks dingy and dirty and not very impressive to visitors or choice riders. UTA!!! Yes UTA has pulled off a victory that was well deserved. UTA is clearly a better transit system to ride. In this case the UTA does most things better that Miami. Can UTA learn some things from the Miami system? Of course, you can always learn from others but I doubt that anyone from UTA that went to Railvolution took the time to learn about Miami-Dade. So who will UTA be up against next? Well, I can't tell you now but will bring it to you when I have an opportunity to check a system out. Originally uploaded by Salaam Allah West Coast Transitphotography KING! One of the problems we have here in the United States in building light rail lines is that it cost more than comparable lines in other countries. Among the problems that causes that is that we build systems like tanks so to survive a crash instead of prevent the accidents, politicians putting pork into the project for such items as neighborhood improvements and what we would be talking about today planning. While good planning is very important, over the last few years the Federal Government is requiring more and more items to be included in the planning. One example of that is the requirement that Bus Rapid Transit is required to evaluated on every project now. While at first this seems to make sense to study alternatives, let me give you some examples from Los Angeles where this is doing nothing but slowing down the process and increasing cost. First of all I would like to thank Darrell Clarke of Friends of Expo for this information. Downtown Connector: The two current light rail lines end at two opposite points of downtown. 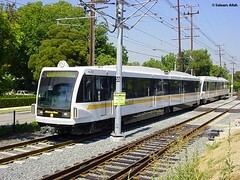 The Gold Line ends at Union Station which at the extreme northeast end of downtown while the Blue Line ends at the 7th/Metro MetroRail Station which is in the center west end of the downtown. 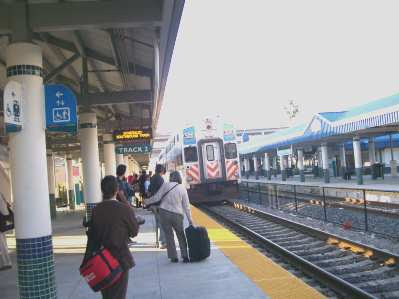 The two lines are currently connected by the MetroRail but requires two transfers are required. The downtown connector is designed to bring these two lines together so that trains can operate through. However, the Federal Transit Authority is requiring them to study BRT for this line instead of light rail. Now why would you connect two light rail lines by a short BRT? Not to mention that the lines are connected by overcrowded MetroRail already. Clearly the study of BRT is political and slows down the process. Wilshire Subway: Extended the current MetroRail Subway from Western Avenue all the way to Santa Monica. Once again BRT is required to be studied as a possible alternative to the Subway. The problem with that? BRT already runs along with route and is beyond capacity. That is the whole reason the subway extension is being studied! Expo Phase II: The first phase of the Expo line is now under construction and they are required to study BRT for phase II. This is equivalent to UTA building the first phase of the University line then having to build BRT to the Medical Center. As you can see in these cases BRT is being used as a Red Herring and is doing nothing but increasing cost. While we need GOOD planning, we do not need planning that is doing nothing but cost us money. Donald Shoup is the author of the book The High Cost of Free Parking which is available through Amazon. Here is a nice interview of Mr. Shoup from Street Films. A tragedy occurred in Layton Saturday night that leaves a family grieving. The tragedy also points out some of the inherent flaws in the way the freeway was designed and it's lack of pedestrian facilities. While we all know that the girl should have never attempted to cross the freeway but lets look at some of the problems created by the freeway. For anyone familiar with the area you can clearly see how the freeway is a barrier between the two sides of it. To make it even worse the two nearest over/underpasses are more than a mile apart. In addition anyone who has tried to walk along Antelope or Hill Field road now that they are extremely pedestrian unfriendly. Anyone who tries to cross the freeway at these two points are taking their life into their own hands due to reckless drivers and the way the roads are designed. Today there is so much traffic along these two roads and the drivers in such a hurray they rarely pay attention if their is pedestrians in the way. 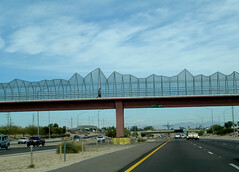 Even in Phoenix which is even more auto centric than Utah, they have put in more pedestrian bridges like the one pictured to insure pedestrians safe passage across the freeway. The original freeway designers, Layton City Planners, and many Layton City Council members all had a hand in this tragedy. While much of the blame can be laid at people who are long gone, it just continues to show how bad planning can lead to tragedy years after it planning was implemented. 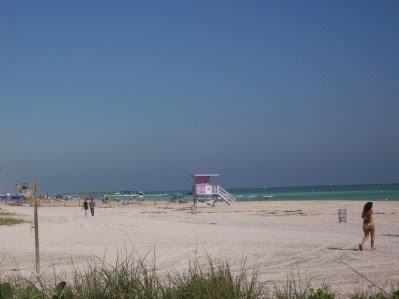 It's hard to believe that it will be one month tomorrow since I got back from Miami and I am just getting around to posting about Day6 of my Miami journey but then again we have had a lot to talk about. This day in Miami will be short. 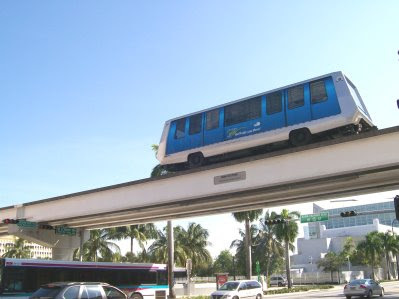 Basically taking MetroMover, MetroRail, and Tri-Rail from my hotel to the Fort Lauderdale Airport to catch my flight to Atlanta and transfer to my Salt Lake flight. 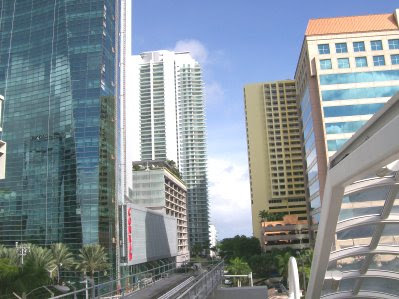 I started out by taking my last ride on the MetroMover. The train was very crowded with construction workers heading to their various construction sites plus their were many others on the crowded car. Once I got off at the Government Station I went up to the third level which serves no purpose at this time or probably forever. 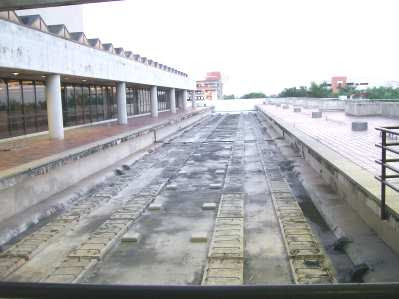 From the TransitMiami blog I learned there is a ghost platform that was supposed to be used by the east-west line that never was built. It is on this third level and as you can see has sat unused for 20+ years. Right in front of this platform was this sign talking about the expansion plans for MetroRail. If you look closely you can see ride and green lines which are extensions now in the planning stages. What is ironic is the placement of this sign in front of this unused platform. The expansion plans no longer include the Government Center so this platform will still be unused. In addition the sign is in an area that gets virtually no foot traffic so it's placement is kind of a waste. 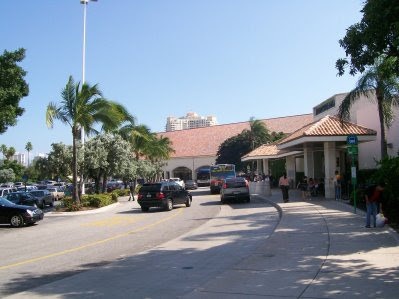 Next I took MetroRail to the Tri-Rail Station. This station is in Hialeah which is not the best of neighborhoods but the station seems to be OK. I went to purchase my tri-rail ticket but the ticket machine was out but there was a person in the Tri-Rail office selling tickets. Not only did I have to come down the stairs you see but then I had to go up an elevator, cross over the tracks, then back down to get to the northbound platform. Several trains were canceled due to mechanical failure but our train was running only 20-minutes late. Even though they had mechanical problems that canceled trains, they did not add any cars to the trains so they were still only 2 or 3 cars long and running standing room only. When our train started approaching a Florida East Coast freight train blocked it's path for another 5 minutes. You can see the freight train in the background and our commuter train is on the other side. But finally the train pulls in and as you can see I was not the only one taking the train to the airport (Tri-Rail serves all three of the major airports in the area). I got off the commuter train and transferred to the free Tri-Rail shuttle to the airport. It was a tiny cutaway van bus which was not large enough to handle the people transferring plus their luggage. They should be using a larger bus for this service, however the bus did get me to the airport with plenty of time to have breakfast before boarding my flight. 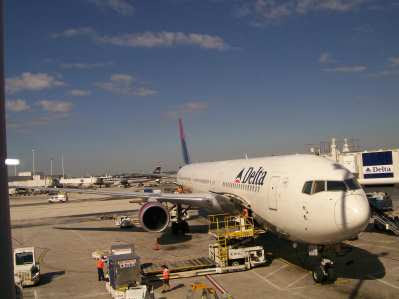 My flight from Fort Lauderdale to Atlanta was on a 767-400ER. Now I can understand the 767 part since this flight gets a lot of cruise ship passengers (as a matter of fact everyone on the plane seemed to have come off a cruise ship) but why an Extended Range model on a captive plane going back and forth on a short route? My flight was on time into Atlanta were I had a 3 hour layover before heading to Salt Lake. One thing I do like about the Atlanta airport is the variety of restaurants. I was able to get Chinese food and eat it while taking pictures of the many planes taxing by. 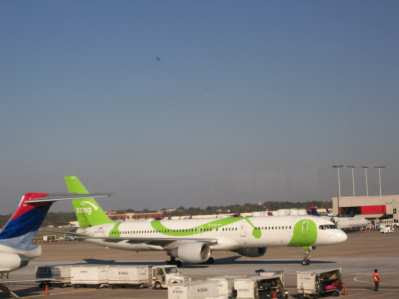 My plane would end up being one of the planes still painted in the colors of the ill-fated Song Airlines which was Delta's short lived attempt at a low fair subsidiary like United's Ted. Here I encountered the most unusually delay in all my millions of miles flying. A water drain plugged up and flooded some of the carpeting in the front of the plane. So the pilot had the mechanics come on board and replace the carpet in that side of the plane. We ended up leaving Atlanta 45-minutes late but made up almost 30-minutes of it by the time we landed in Salt Lake City. 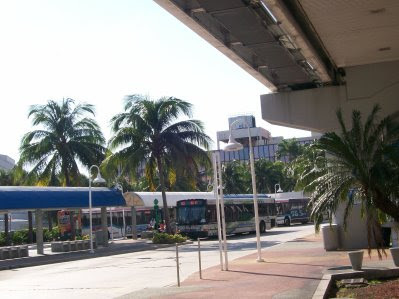 So how did Miami-Dade County Transit and Tri-Rail compare to UTA? Keep your eyes out as I will be posting that soon and also will be going to detail about some aspects of the MetroMover system especially when compared to streetcars. Those wasted capital resources start getting there 4 months of work. You have to feel sorry for the operator of the train as it is something that you will never get over. Lets hope the city of Murray does a better job with this development than they did with the development along 5300 South. Looks like Drew Chamberlain has crawled from underneath the rock that he should go back under. Lets see, TRAX ridership is not down 30%, and Commuter Rail will provide congestion relief to anyone who uses it just like TRAX. Since he is also trying to get Inglish fired I wonder if he will make a deal with the devil like his buddy Rubin did in Los Angeles and support the Bus Riders Union. 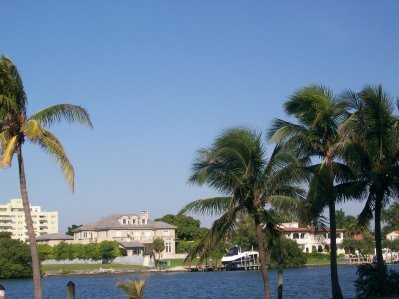 My last full day in Miami. 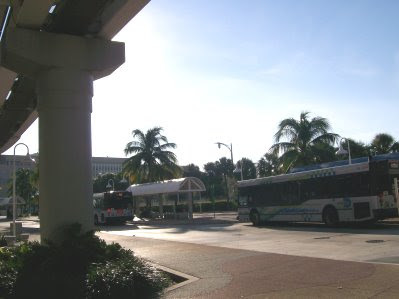 Once again my journey today would start the Omni Bus Terminal which is next door to the Omni MetroMover Station. 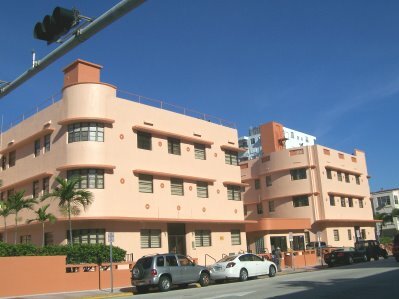 I got off the bus at 24th Street and took several pictures including of this apartment compex. I walked a few blocks then caught another S bus to take me further north. This time I got off at 45th Street and took a large number of photographs while walking north. The temperature was actually not that bad so I just continued walking for about an hour. Here are a sample of the pictures I took. Here is a southbound S bus. I walked all the way to the Atlantic Heights area before catching another S bus and took it farther north to the Haulover Park area where I got off a took some pictures of the beach area. I then caught an H bus which I probably would have missed because I couldn't see the bus company but someone else got off and the driver jumped off and started smoking for a few minutes. We then head north and then west over to the Mall at a 163rd. I needed a new pair of jeans which I purchased at the mall then went to catch the 3 bus. I saw several of these Miami Mini Buses running in this area of Miami and I gather they are operated by and for Haitian Immigrants although anyone can ride. Next I took the 3 bus down to 135th where I saw a place called Jumbo Buffet yesterday. Yes I still haven't had the Chinese food I have been craving for several days and this provided me the opportunity. I rarely find a Chinese place that disappoints me but this one did. The restaurant was located half way between two bus stops and since walked north from the previous bus stop I decided to continue walking north to catch the bus. I barely got out of the restaurant when a southbound 3 came by. This picture shows that bus stopping at the bus stop were I would catch it. This road was way too dangerous for me to attempt to cross and since I was not in a hurray why worry. Maybe I should have worried? Here is a sign you don't see in Salt Lake City. The next 3 came along and headed back to the hotel. I decided to stay in the hotel and watch the Nextel Cup race, have some dinner at Burger King before getting ready to catch my flight back to Salt Lake City the next day. 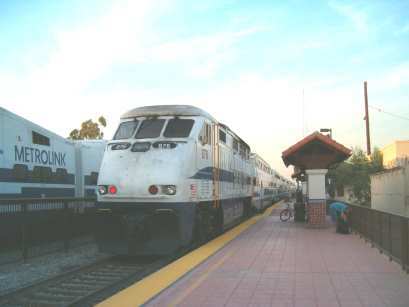 Above is a picture of a Los Angeles Metrolink train heading to Riverside from San Clemente with a train heading to Oceanside on the other track. The train is six cars long, each one seating 165 passengers and the train was standing room only. Yes the commuter rail network is popular.